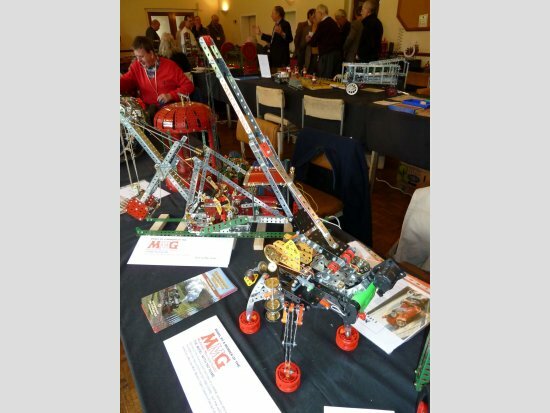 Cool, overcast but thankfully dry weather conditions prevailed throughout on the day of the Midlands Meccano Guild’s 90th Meeting. The dry conditions allowed us to take a large model outside for photography, but more of that later. Terry Pettitt’s crawler bulldozer was “somewhat similar” to the Eric Taylor version but had a different transmission and track construction. 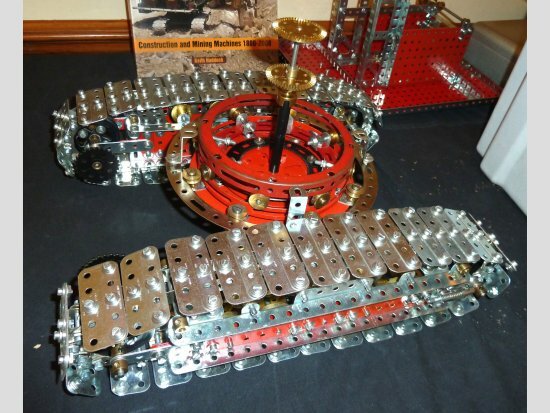 The track plates are constructed from 2½” flat girders hinged together using fishplates with one end rolled over to form a hinge with a 2½” axle rod. The jig to form the fishplates was shown at a previous meeting. 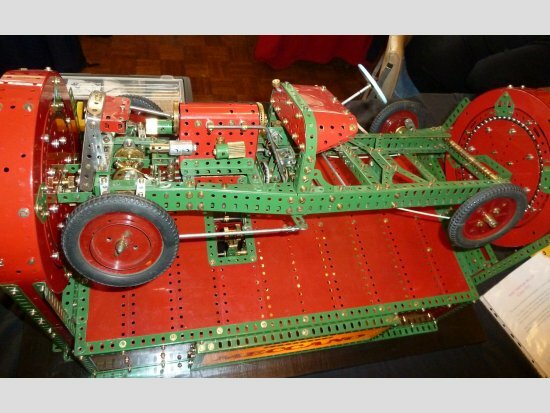 If ever sculpture and Meccano came together, the result could not be more beautifully formed than the 1937/38 Bugatti Type 57SC chassis built by Terry Allen. Besides being resplendently presented in sparkling shiny parts, the model’s contours were a fascination of complex compound curves, accurately representing the original’s streamlined and gracious outline. 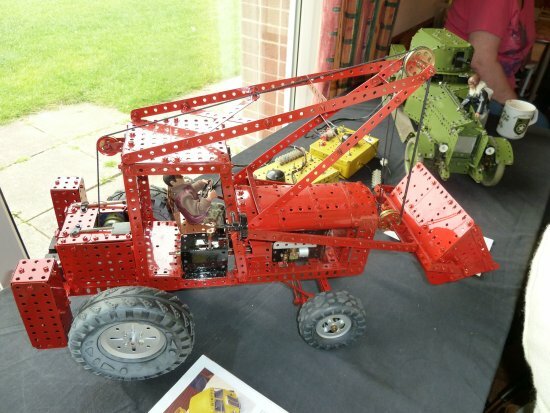 John MacDonald showed two models; the first was a 1950s Chaseside (Fordson) tractor in red, with lights, differential, an elevating bucket with trip, powered by a 12v motor via a two-speed gearbox. His second model was a 1920 Rolls Royce armoured car with a clutch, three-speed and reverse gearbox, rear axle with torque tube, cantilever rear springs, semi-elliptic front springs, a training turret, elevating gun, lights and a remotely actuated opening radiator shutter. The whole model was beautifully finished in army green including the correct period disc wheel centres. As we all know Meccano had to cease manufacture during WW2, but some outfits were able to be made up before the restrictions took hold. Of particular interest were the sets destined for export, which often consisted of a non-standard combination of colours. A set 9 Quayside Unloader built from one of these outfits, (a 1940 set 10) was shown by Tony Brown, along with a Jubb Trencher, “a machine almost – but not quite forgotten by history.” Both models carried 1929 type Steam Engines for power but Tony has “still got the interesting things to do” with installing the two winding drums on the Trencher. 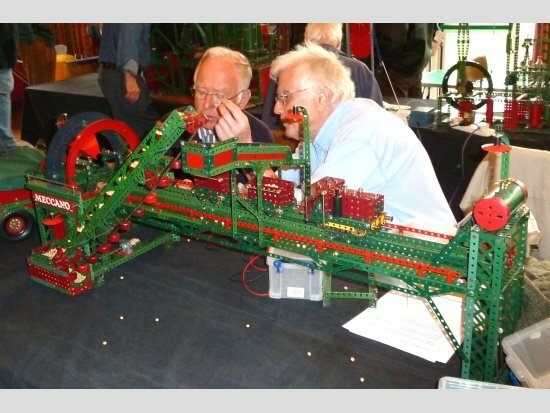 Robin Schoolar demonstrated his 1:43 scale Delftshavense Schie Bascule Rail Bridge, the original of which carries a trunk rail line over a primary inland waterway, not far from Rotterdam in the Netherlands. As the crossing is on a skew alignment the bridge accommodates this with an inspired asymmetric design, creating beauty with utility. 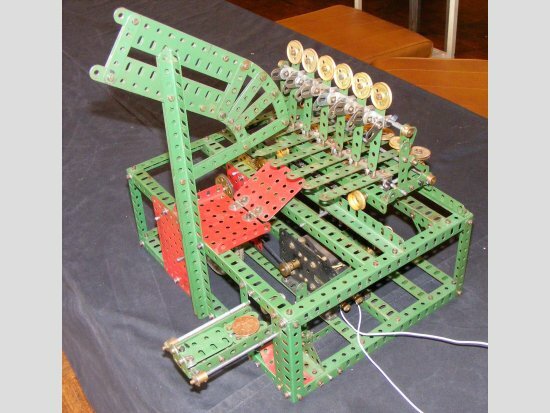 In his notes, Robin asks, “Maybe this classic could be called a Baskewle Bridge?” This imposing model is so efficient in its operation that a small red-cased Meccano motor operating on only 3v provides adequate power. 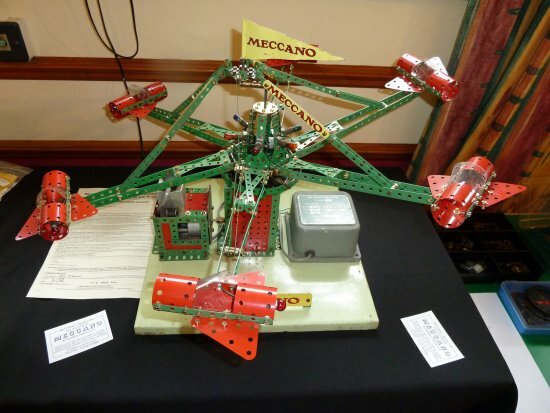 Two window display Meccano models were shown by Richard Gilbert of Devizes. 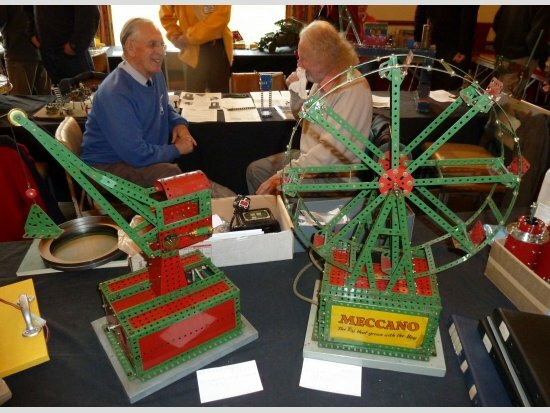 There was a Ferris Wheel (similar to model 5.9) from 1954/55 and an Elevated Jib Crane (similar to model 4.4) from 1953. 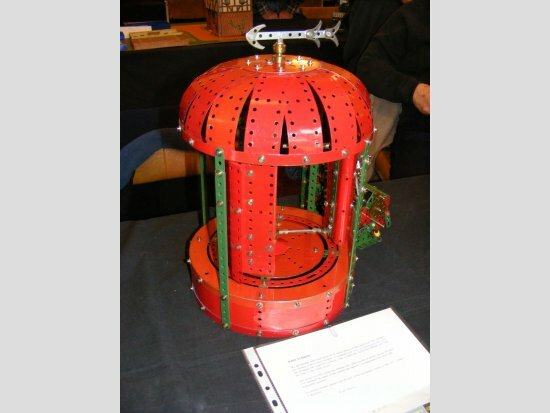 Both models were originally illuminated in their bases so the Meccano transparency created a highlight, and both were powered by large mains motors. 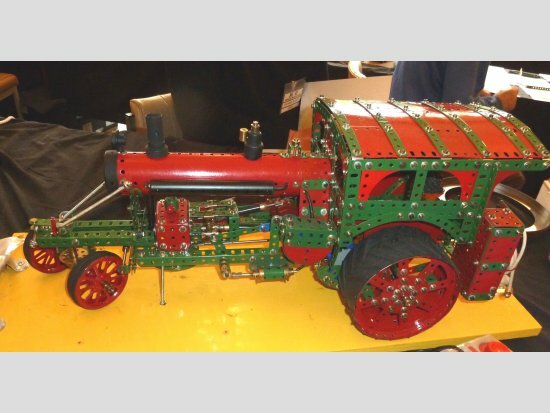 From a century ago came Dave Phillips’ inspiration for “The mighty 1911 Avery 40-120 undermount”, a traction engine model constructed from photographs in “Old Glory”. It had a differential built inside the offside drive wheel, a compound (two cylinder) steam engine and a governor which was only operated while driving static machinery. I would feel uncomfortable driving a car with its petrol tank mounted above the dashboard, with its filler placed perilously close to the engine, but apparently owners of the 1928 Alvis front wheel drive sports car had no qualms about these matters. Other notable features included independent springing to all four wheels and various unconventional modifications to its engine. 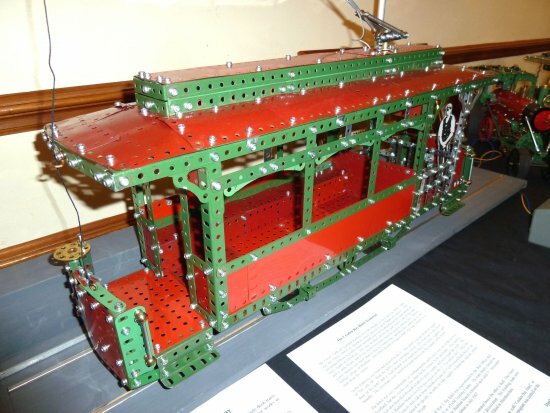 Based on the October 1933 Meccano Magazine design, Roger Marriott’s version incorporated many improvements to enhance realism, being finally installed into a rotating window display mounting. Although Roald Amundsen was the first man to reach the South Pole on December 14th 1911, it is the story of Captain Robert Falcon Scott’s courageous but ultimately doomed expedition that captured the hearts and imaginations of generations thereafter. 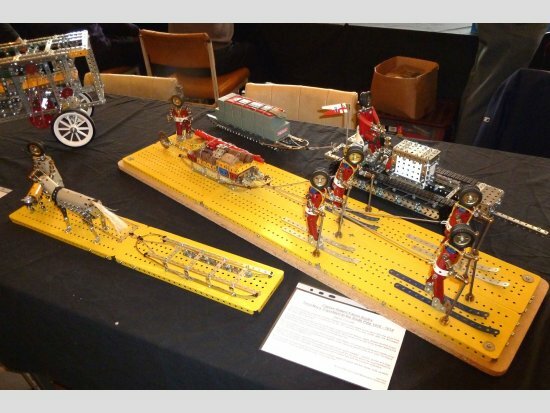 John Reid showed one-tenth scale dioramas depicting the various methods Scott employed to pull the sledges; tractors, ponies and dogs, but the final “push” for the Pole being by man-hauling. 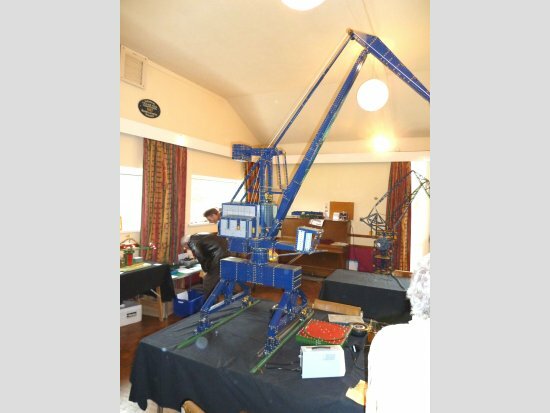 John also showed a work in progress consisting of a 1926 pattern Ransomes threshing machine, built to be complementary to the Meccano Set 10 leaflet 13 Combine Harvester. 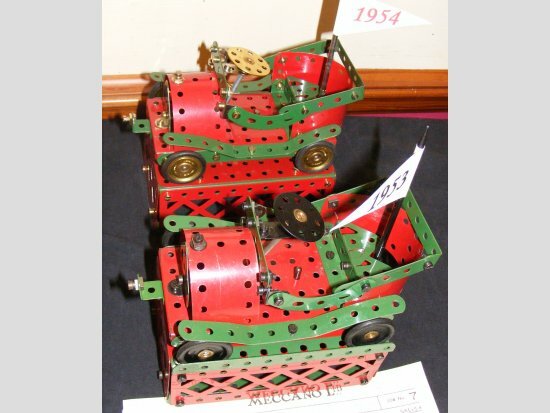 Terry Bullingham of Smethwick showed his red and green steam driven alternator. As always with Terry’s models, the fine detailing was of a very high standard with the various ladders, walkways and other details painstakingly reproduced. That Terry managed to get so much accurate mechanism into a compact 12½” by 5½” base is a testament to his modelling skill. 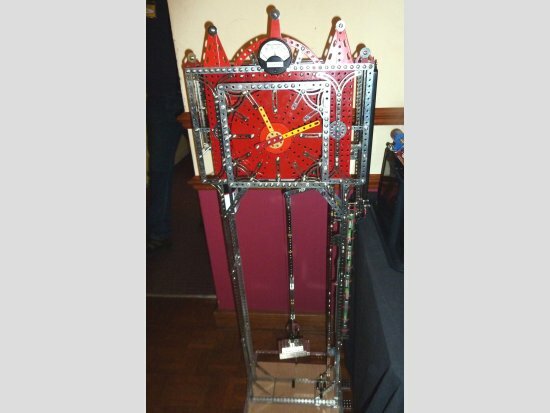 Tim Martin showed three fascinating and complex models, the first being “Time Goddess II” which offered many enhancements on Tim’s previous clock shown at the last meeting. This version was self-winding, with the nine AA batteries kept fully charged by a solar panel fitted to the side of the clock. Other features included a conventional clock face and a facility to automatically correct for fast/slow running by simply adjusting the minute hand – which also shortened or lengthened the pendulum. Tim’s second model was a “Cool Show” in which a double spiral rotated to provide an optical illusion. Tim pointed out that the bearing for this had to be reinforced to maintain exact vertical alignment with no wobbling – otherwise the visual effect would be ruined. Finally, Tim showed a Gear Tooth Counter with which the number of teeth on any gear could be quickly and accurately counted. This was especially handy, Tim commented, for horologists. With gears from other systems, compatible and reproduction parts suppliers now easily available, I can imagine Tim’s model having an increasing usefulness in the future. Radio control is becoming an increasingly common feature these days and Dave Bradley has such ambitions for the M.A.N. TGM 15 ton flat bed lorry he showed. Built to one-sixth scale the model incorporated a realistically outlined cab in pristine yellow flexible plates with opening doors and plush-looking red seats. Geoff Devlin’s Cruden Bay Tramway model had a cardboard cut-out driver at the controls, and this attention to detail was carried right through the tram to include arched window frames and a two-level clerestory roof. In his notes Geoff states that there were two of these single-deck trams in use on the Cruden Bay tramway, with each tram carrying 16 passengers with their luggage, plus supplies for the hotel. Both trams were built in the GNSR’s Kittybrewster works in 1898/99 to a track gauge of 3’6”. The original for Geoff’s model can be seen at the Grampian (NE Scotland) Transport Museum which opened for the season at the beginning of April. 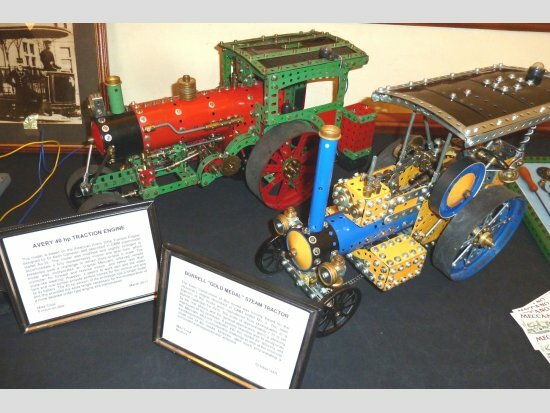 Mike Cook brought along two traction engine models; one was based on the American Avery 20hp Traction Engine designed by Dr. Keith Cameron and described in GMM supermodel leaflet 25. 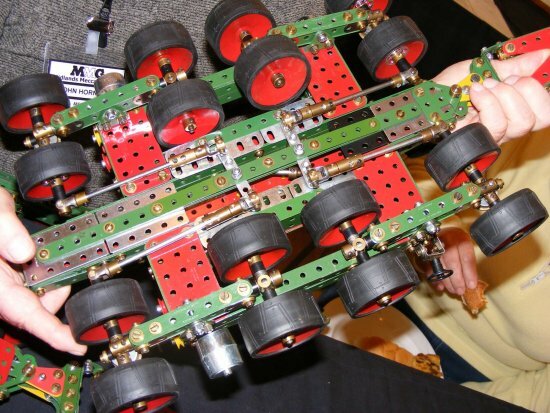 Mike slightly enlarged and modified this to incorporate a fully representative motion and gear train, plus an original Meccano infra-red remote controller for forward/reverse motion plus steering. 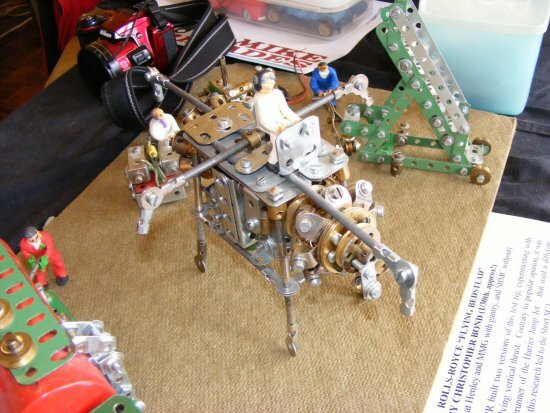 Mike’s other model was loosely based on the showman’s engine described in GMM supermodel leaflet 5. 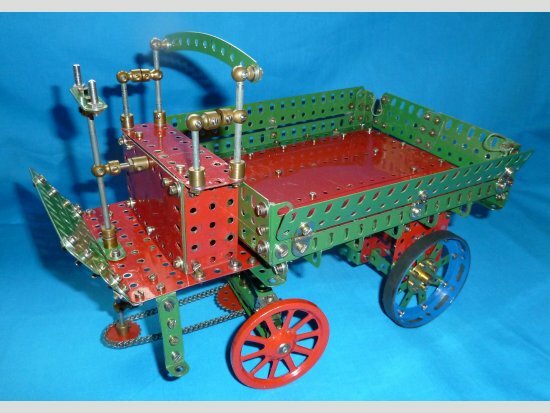 The Burrell “Gold Medal” steam tractor’s 1:12 scale was set by the rear wheels and again, Meccano’s infra-red remote control system was built in, for steering and travelling functions. 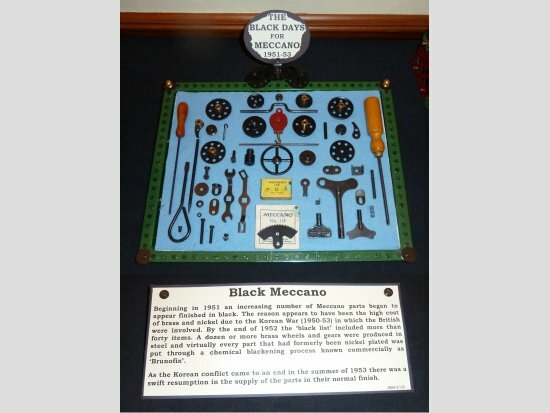 Jim Gamble provided an attractive display of “Black Meccano” parts which reflected the temporary shortage and hence high cost of brass and nickel during the Korean war of 1950-53. As an alternative to these finishes a process known as “Brunofixing” was employed, giving some 40 hitherto nickelled or brassed parts a black appearance. Common examples included Bush Wheels, 57t Gears, Flanged Wheels, 1” and 1½” Pulleys, Wheel Discs and clockwork motor keys. The good news was that after the Korean conflict had ended, there was a rapid return to normality, as was shown by two small Meccano cars also shown by Jim. The 1953 version had many Brunofixed parts in evidence, but the 1954 version of the same model sported shiny brass-finish 1” Pulleys, Nuts & Bolts and Bush Wheel. 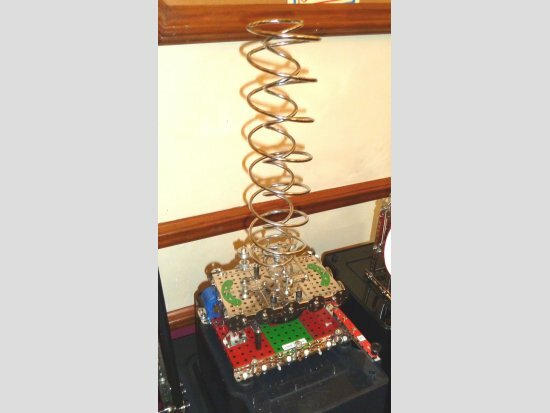 Paul Brecknell showed a crawler track base modified from an Eric Taylor design. It employed a concentric drive using a 6½” Rod inside a Multikit plastic gun barrel. 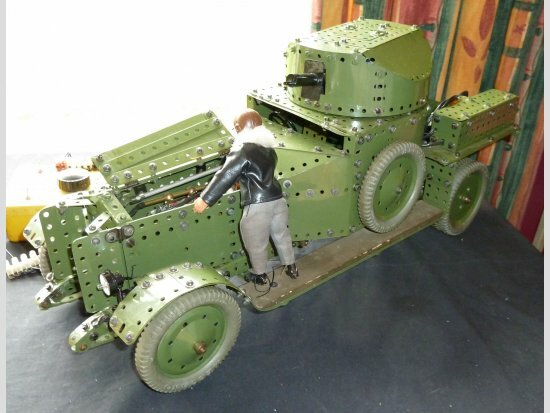 Although Paul is very reluctant to mutilate Meccano parts he did confess to shortening the gun barrel to better fit the space. Paul’s improved version of the turntable using hook rollers will give better stability for the completed model. 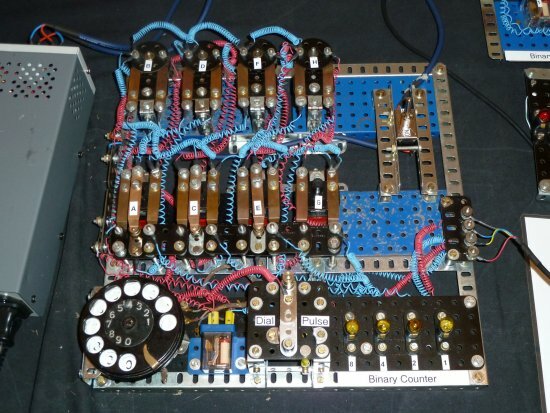 was the reaction from one onlooker when viewing Stephen Jeavons’ 4-bit binary counter. As I know nothing of this sort of technology myself I refer to Stephen’s own notes which state, “The primary objective of this model is to demonstrate the possibility of utilizing Elektrikit parts to make working multi-pole relays. 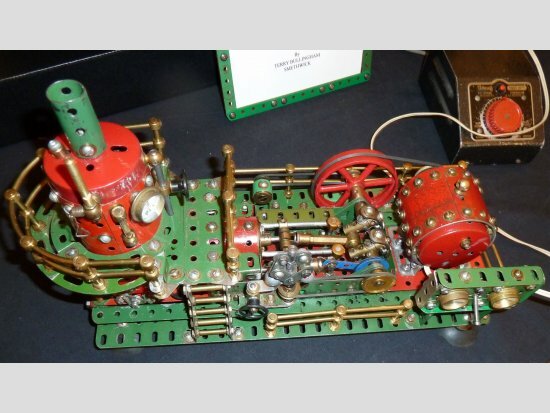 Several different designs exist on the model.” Everything was built from Elektrikit, Meccano Electronic and Meccano standard parts except for the telephone dial, the MW Models micro switch and a light-emitting diode. 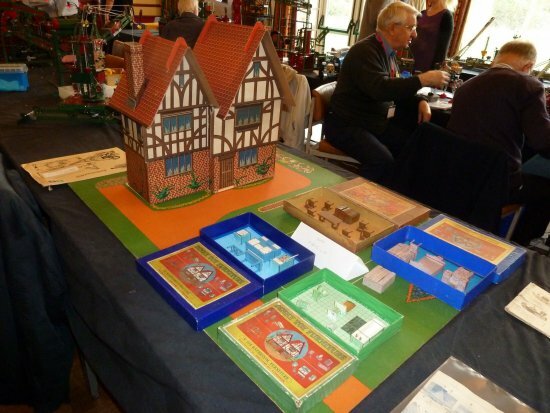 Stephen has produced an excellent video of this model and it can be viewed by clicking here. 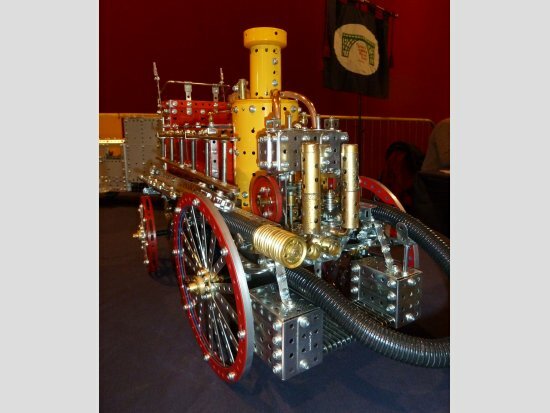 A Shand Mason Twin Cylinder Vertical Steam Fire Engine dating from 1895 was the inspiration for George Illingworth’s version in a scale of 1:6. This appliance was fitted with a shaft for two horses and the predominantly red and zinc colour scheme was offset by a vertical boiler in yellow. The driver’s seat and foot rest were modelled in grey and the model abounded in exquisite little details including finely contoured handrails and pipework. 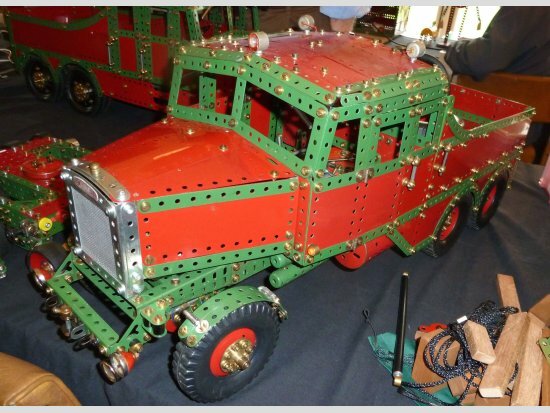 George’s other model moved us forward in time by almost 50 years to 1944, in the form of a 1:12 scale National Fire Service Mobile Repair Van on a GMC AFW 354 chassis. Presented in an overall wartime grey finish this left hand drive vehicle was fully up to George’s usual high standards of detail and realism, and effectively captured the original’s sense of purpose. We can always rely on Alan Covel to spring a surprise, usually a big one, and his latest creation was no exception. 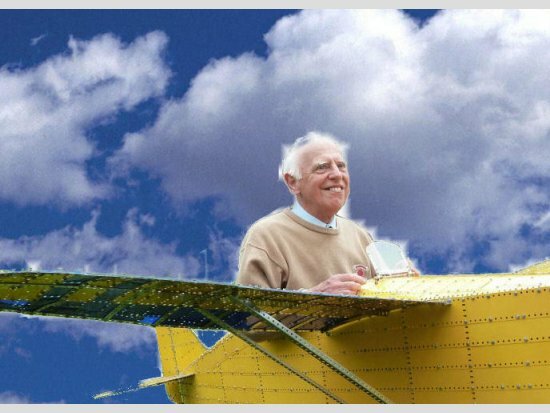 Drawing heavily on Alan’s good humour (and stock of pristine yellow Strip Plates) was his “Freelance Monoplane”. 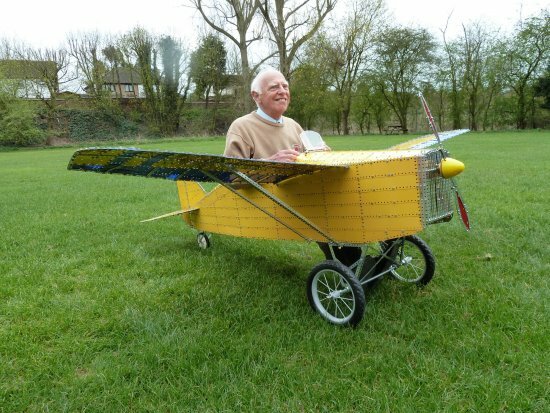 This was big enough to seat its builder, although when pressed to actually sit inside, Alan declined, stating that although fitted with a seat, it had not been designed to actually take the weight of an adult pilot. However, with further encouragement, Alan did relent and posed for pictures whilst firmly ensconced in the plane. How about this for international co-operation? 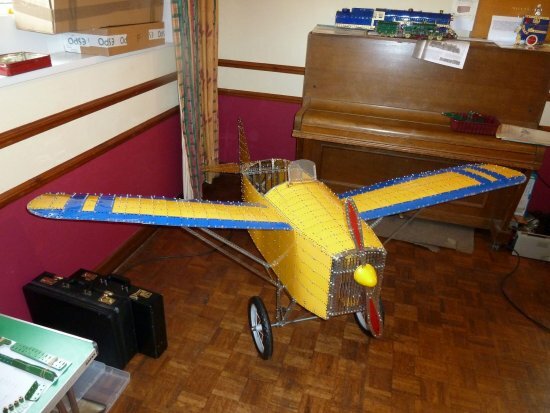 Michael Adler, who lives in Israel, expressed the intention to attend this year’s Skegness Exhibition, but his model was too big to bring along. 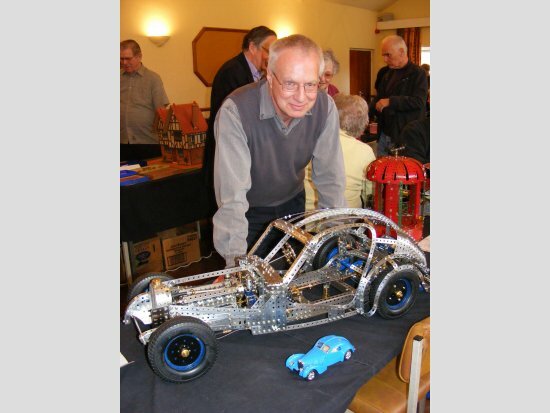 To solve this problem, Richard Payn agreed to build another example of the model with his own parts, on Michael’s behalf, and take it to the show where it will be united with its designer. 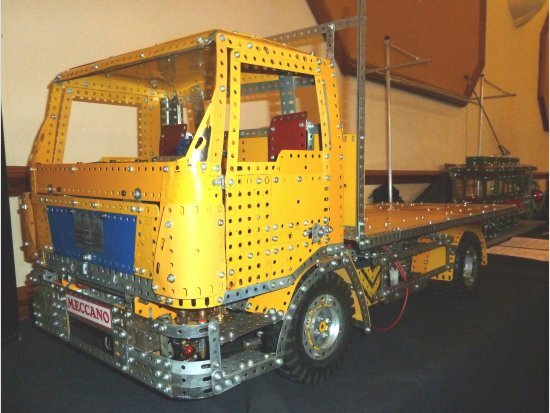 And what a model it was – based on the German “Takraf” crane and built to Richard’s usual high standard, employing beautiful dark blue strips and girders, with grey flexible plates for the cab, most of which can surely never have been used previously. Of the model’s many outstanding features I must mention the double differential winding system. One of Richard’s own designs, this allows for slight roving discrepancies between the dual hoists, to be automatically taken up and corrected even while the load is still being lifted or lowered. Richard’s other model was his completed Scammell Super Constructor heavy tractor, parked adjacent to John Hornsby’s same scale version of the Scammell Constructor. John’s version had benefitted from a number of enhancements since I last saw it, including a beautifully finished tarpaulin made by John’s wife Elsie; a vertical winch with paying-on rollers to ensure even roving of the cables and a 200-ton trailer with two 16-wheel bogies and removable trailer bed.The steering mechanism on both bogies was seen in action, with the trailing bogie incorporating an ingenious mechanism allowing for its steering action to be controlled either manually or automatically by sensing the direction of the leading bogie. The numbers involved in these two bogies soon began to add up, with 16 wheels on each making 32 for the pair, and each wheel having two conical discs making 64 in all. Almost by serendipity, John found that the slight lip on the inside of Conical Discs, provided an ideal fitting for the wheel centre embellishments taken from the 1990s type rubber road wheels. The overall impression was that of uncompromising power and quality – a worthy recognition of the great name of Scammell. 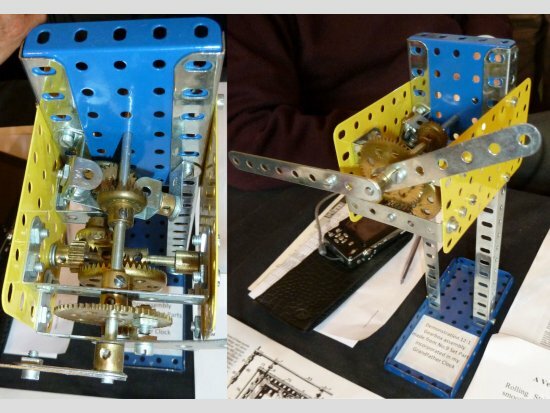 Geoff Wright made the trip from Henley to show some small but fascinating constructions, the first of which was a demonstration of how a clock mechanism could be arranged from the contents of a “traditional” Meccano Outfit 9. This of course contradicts the assertion (in the instructions for the Mantle Clock model 9.8, page 21 in the 1955-61 Outfit 9 manual), that a 12:1 ratio could not be made between the hour and the minute hands, from the contents of that outfit. 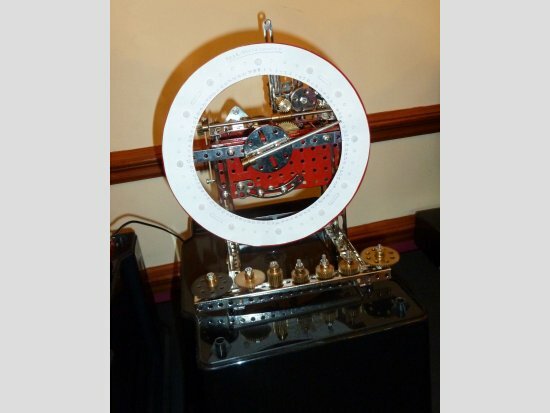 Geoff also showed a neat idea for centring a 216 Cylinder between two Faceplates, to form a winding drum. As the presently suggested idea of connecting the Face plates by four Screwed Rods inside the Cylinder, does not allow for exact centring, Geoff suggests placing four bolts in the holes around each of the Faceplates’ bosses, and the Nuts inside on these Bolts’ shanks, precisely centre the Cylinder when it is placed over them. Mick Burgess showed a Canadian Pacific Locomotive which was slightly modified from the original Outfit 7 instructions. By adding ½” to the mainframes, Mick was able to use an extra pair of 187 Road Wheels instead of the pair of 20A 2” Pulleys. The bell came out of a Christmas cracker and certainly looked (and sounded) more realistic than the swinging pinion depicted in the original instructions. 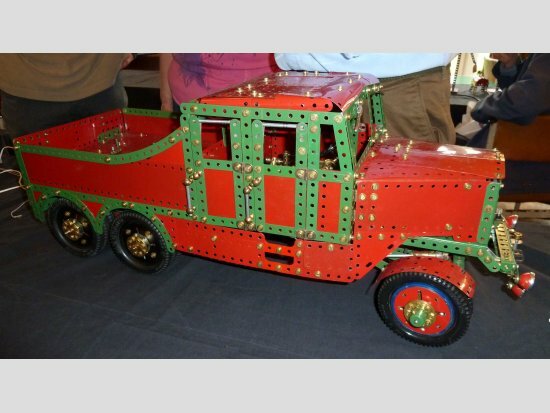 Another locomotive from old Meccano literature was the basis for the second of Mick’s contributions. 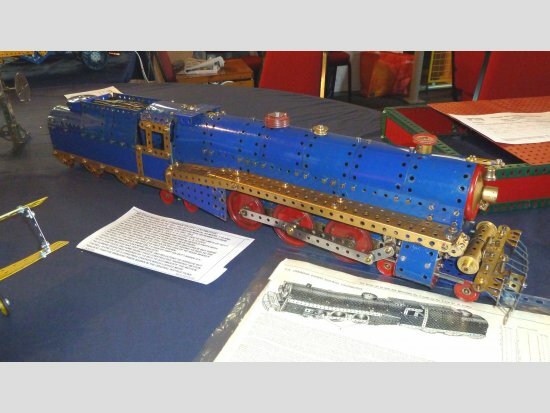 This was the famous Midland Railway 4-2-2 ‘Spinner’ as originally designed by Keith Cameron and featured in the April 1926 Meccano Magazine and later instructions manuals. Mick incorporated some modifications to his version, including Stepped Curved Strips to create a more correct rounded shape to the wheel splashers, and a third set of wheels to the tender. Terry Wilkes’ model 9.8 Conveyancer from the 1970 series Outfit 9 was not constructed exactly as per the instructions because, (Terry explained,) as shown, it didn’t work or fit together! (Nothing new there, Terry!) 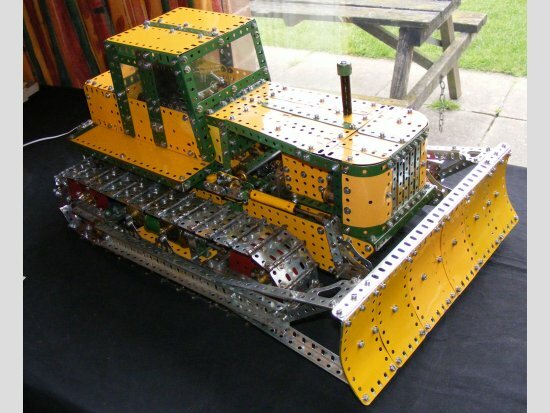 His second model was based on a Massey Ferguson MF 135 Tractor with “Pup Treads” tyres for the rear wheels, and it pulled a “Rotaspreader” manure spreader. I am no expert on Dolly Varden so I made an online search to discover it was (among other things) a type of trout or a character from Dickens’ novel, Barnaby Rudge. It was rumoured that the Dolly Varden Doll’s House from Meccano Ltd. in the mid-1930s was named after a briefly famed starlet of the day, but I can find no evidence to back up this theory. So, I must assume that the Dolly Varden Doll’s House was named after the Dickens’ character. Whatever the provenance of the name, Roy Whitehouse’s splendidly preserved example sat proudly in all its coloured cardboard splendour, among the lawns, flower borders and driveway of its own baseboard throughout the meeting. To complete the display, Roy brought along four sets of furniture available at that time, still in their original boxes. Stephen Wilson showed his version, built 13 years ago, of the famous Revenge class battleship built from the F-L manual. Constructed in nickel parts, the model certainly conveyed the purposeful atmosphere of the original. 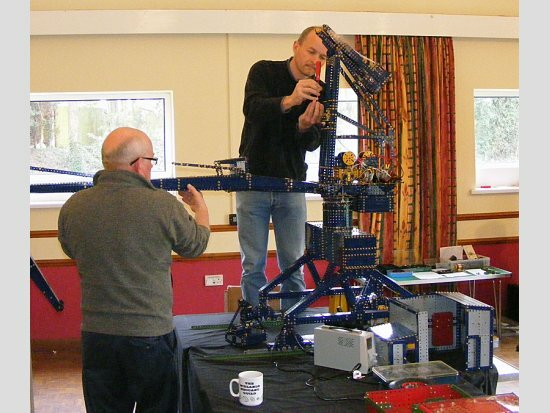 John Ozyer-Key demonstrated his version of Eric Taylor’s Dockside Crane, with enhancements including full radio-control and an improved design of grab. 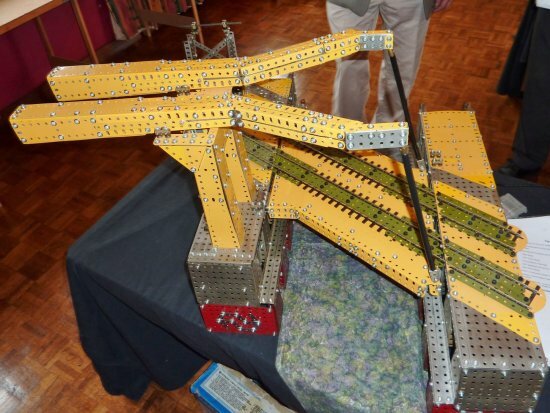 His model was built using dark blue/yellow parts and travelled on rails mounted on a wooden baseboard. 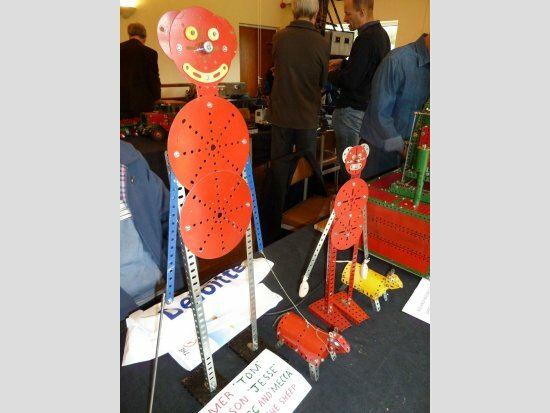 Tom & Matthew McCallum showed a Binns Road display model of rockets, in light red and green parts, dating from the 1960s. 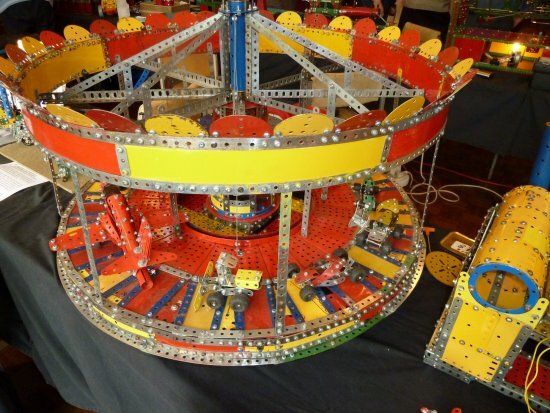 Regular exhibitor Paul Hubbard showed his Fairground Roundabout which is so big that a full circle of 24 Flanged Sector Plates forms only the inside half of the total deck area. As with the original version, Paul’s roundabout was well supplied with transport-related models including two Red Arrows’ jets and quad bikes. 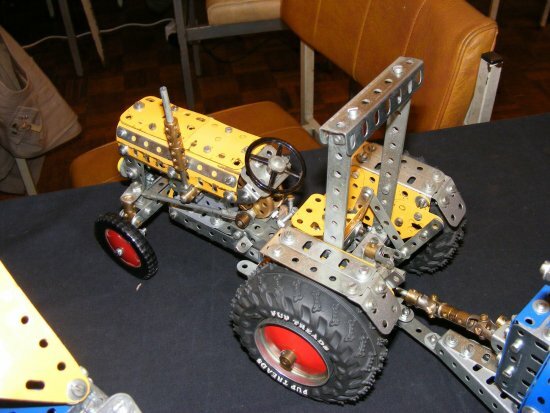 Mark Rolston’s part-built chassis which was shown at the last meeting, was shown to have progressed into a nearly completed model. 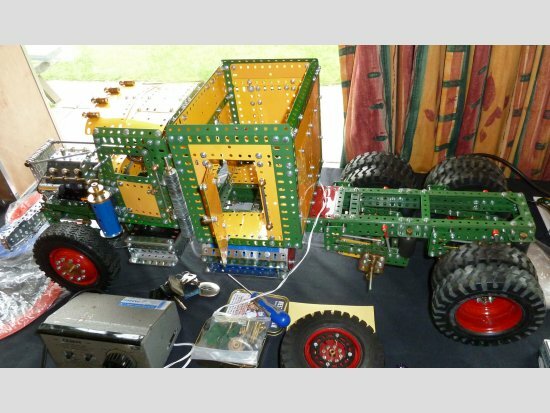 Based on a ten-wheeled tractor chassis, the model employs a combination of ash tray tyres and Watt’s industrial tyres from Mike Rhoades. 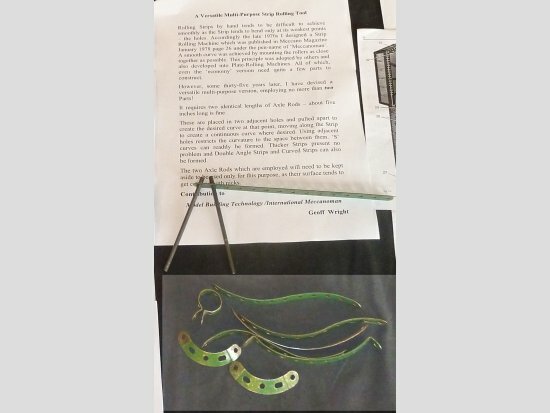 The wheel rims are of particular interest though, being spun metal and punched with holes around the centre, to which custom-made solid brass wheel centres were fitted. 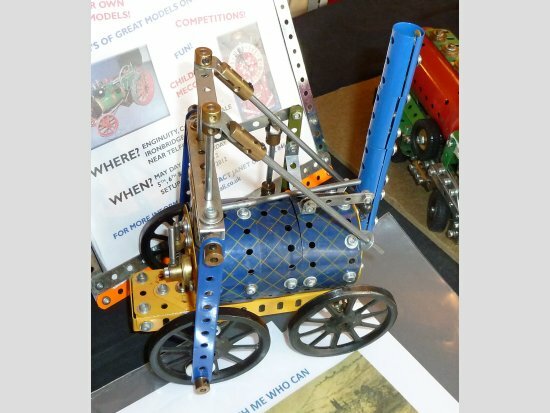 Keith Way brought his “Catch Me Who Can” Trevithick type locomotive using blue/gold hatched plates for its boiler and utilising Spoked Wheels to good effect. Four Sleeve Pieces formed the chimney and the model demonstrated a realistic con rod motion to its vertical cylinder as it was pushed along. 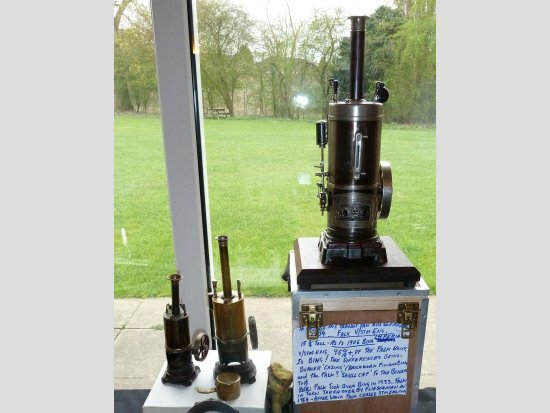 Colin Reid proudly added to his millionaire’s wish list of original steam engines (see the last meeting report) by recently purchasing a 1934 Falk (German) vertical steam engine. This was truly a magnificently engineered unit, displaying a standard of workmanship which is rarely seen in anything produced today. “Farmer Tom and his son Jesse” were certainly not to be overlooked, as they walked their dogs “Mec” and “Mecca” to go and feed the sheep. 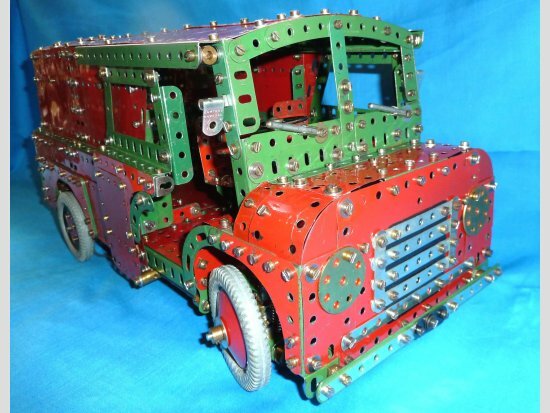 The point of the exercise was to demonstrate what could be achieved with as few as 20 Meccano parts, and the results, by Sid Beckett, were certainly original, surprising – and eye-catching. 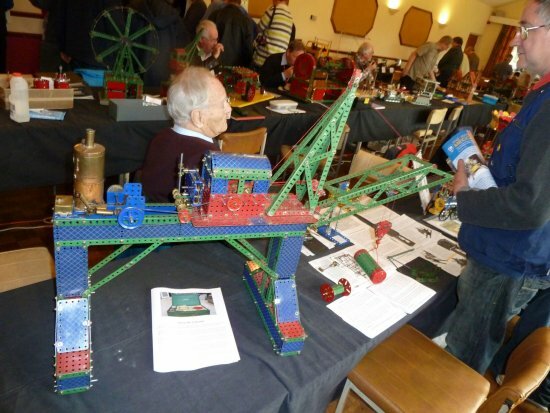 Brian Compton made so many modifications to his Coal Loader/Unloader model since the last meeting, that at first I thought it was a completely new construction. Basically, nearly all the modifications have had the effect of simplifying the mechanism without affecting the many operations. ‘Getting the same job done, but with less’, one could say. Other changes have been more concerned with the appearance of the model, including lights and a neatly executed walkway. Mei Jones called his crane “The Model With No Name” in respect of the fact that it was given no title in the instructions manual from which it was built. 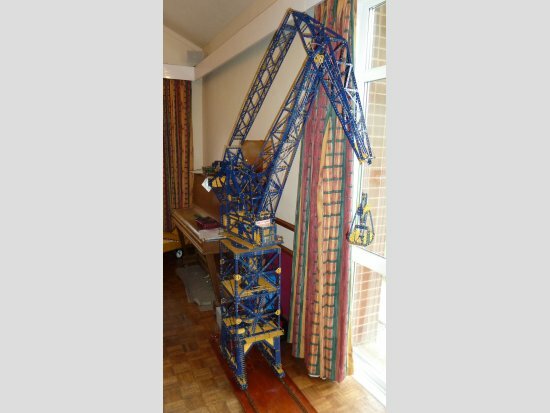 It was in fact an elevated jib crane (from the Special Edition Set 7080 from 1998), standing firmly on four ‘legs’ formed out of 5½” Curved Strips. Mei also showed a variation on Supermodel 19a Steam Excavator, but running on rails and with a compound curved roof reminiscent of the Grabbing Crane model 8.4 in the 1950 outfits 7/8 manual. The Lifting Shovel from leaflet 6 in the Set 10 series, completed Mei’s display. but while I am waiting for Lady Luck to smile, I could content myself with Tony Parmee’s “Dancing Girls” or more correctly, “Aunt Sally” automat machine as originally described in the Meccano Magazine for February 1961. A 2p piece (refundable – I haven’t won the Lottery yet!) placed in the tray and inserted, resulted in an E20R motor powering up and the action beginning. The idea was to slide one of seven Wheel Discs down the slide so it knocked one of the levers attached to one of the six moving Aunt Sallys. The action was repeated until hopefully, all the Aunt Sallys had been knocked down. A 1/30th (approx) scale 1954 Rolls Royce “Flying Bedstead” was shown by Christopher Bond. The original research did not lead to the Harrier Jump Jet as is commonly supposed, but it did lead to the Short SC1. Christopher’s model accurately conveyed the revolutionary outline of the two prototypes, both of which eventually crashed with one fatality. Christopher also brought a compact (2½” wide) but nicely detailed tanker lorry in red, zinc and green parts. 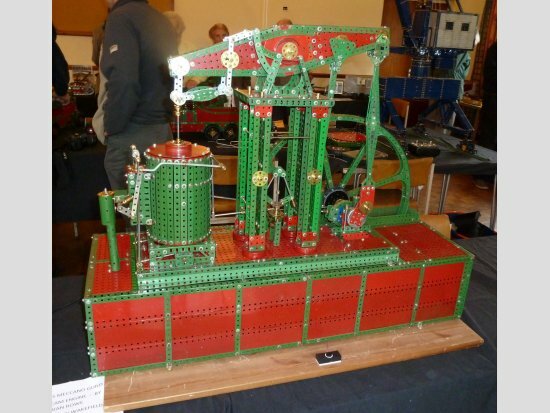 Tony Wakefield showed his version of the late Brian Rowe’s Beam Engine, which looked resplendent in its red and green parts. A press button fitted to the model’s wooden baseboard allowed onlookers to set the engine in motion. 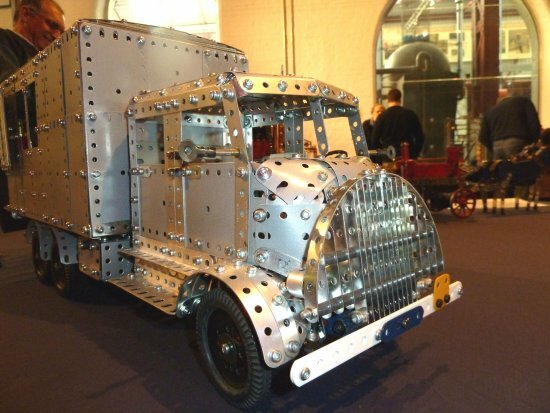 Brian Edwards brought two finely-built models on a goods delivery theme, one of which was a Daimler Underfloor Engine Lorry based on an 1895 design. His other model was of a Bedford CA Type Van from around 1955. This latter model had sliding side doors and was constructed using, appropriately enough, parts in the 1950s red and green colour scheme. So that just about completes the model report, now is the time to dismantle the models and pack up and face a possible long journey home.